Duct work is one of the most important elements for proper heating of any home, but exposed duct work in an attic or basement can be an ugly sight. Covering the duct work in a basement can make an ugly room look more appealing. Putting up drywall to hide the duct work is a task that most homeowners could complete in only one afternoon. Duct work in a basement can be covered easily. With a tape measure, measure the area that will need to be covered, climbing a ladder if necessary. Write down the measurements so that a framework can be built around the duct work with 2-by-4-inch lumber. Cut lumber to size using a circular saw and begin building the frame, leaving 1 inch between the frame and the duct work to allow for expansion. 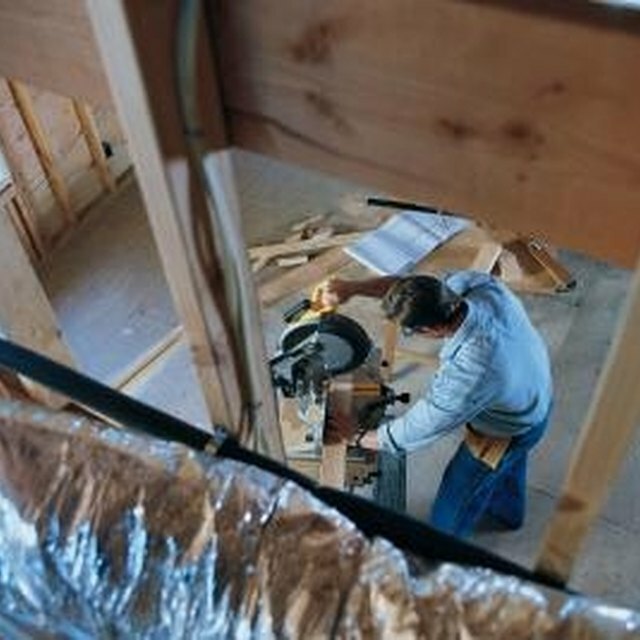 Begin the frame off of a stud from another wall and carefully work around the duct work. Build around the entire area until the duct work is surrounded by a frame. Measure to make sure there is only 1 inch separating the duct work from the back of the frame. Cut the drywall to size with a utility knife so that it can be attached to the studs of the frame. Score the drywall using a T-square and line it up to the frame. Drill it in place with drywall screws every 16 inches down the entire frame. Connect drywall to each stud all the way around the frame until the duct work has been completely covered. Look over the drywall to make sure there are no gaps. Use a vacuum to clean up any dust and debris that remains from the drywall and lumber. Safety goggles are highly recommended when using a circular saw because sawdust can become dangerous if eyes are not covered. Consult with local regulations to determine if the duct work can be covered legally. Different cities and townships have varying regulations regarding covered duct work.